Please refer to our stock # 3159 when inquiring. 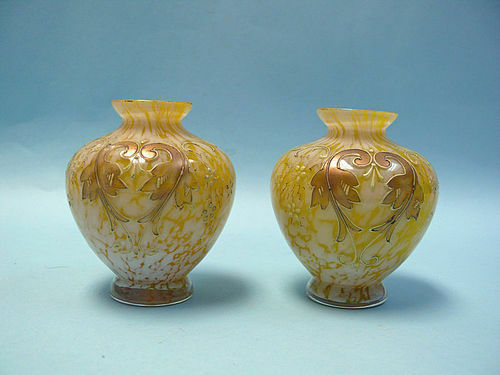 Sold only as a Pair, Victorian Yellow Gilt Glass Mini Vases, England, ca. 1880. Bulbous in shape with footed base. Mottled in white and yellow pigment, with gilt floral motif. In excellent condition. 3 1/2" high x 3 1/2" diameter. According to Victorian furniture collector John Werry, the Victorian era encompasses aspects of numerous design movements. Gothic Revival, which began in the 18th century, was still going strong during the Victorian Era — the British Houses of Parliament, a good example of the style, were commissioned in 1836 and completed during Victoria’s reign. French Rococo also left its mark on English furnishings and architecture from about 1840 until 1865. The Renaissance Revival (also known as Neo-Renaissance) followed until about 1890, when the Eastlake and Aesthetic movements took over. They, in turn, were the catalysts for the post-Victorian periods of Art Nouveau and Arts and Crafts.